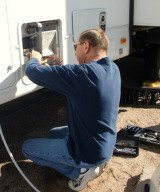 How to replace low beam headlight on our Winnebago Journey? Also if possible switch over to LED globes. They use 80% less energy and last 30,000 hours plus so you'll never need to replace again.